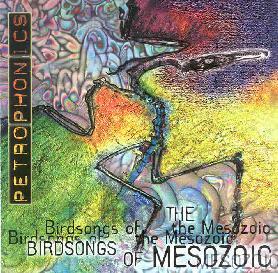 Birdsongs Of The Mesozoic - "Petrophonics"
The latest from BOTM is an impressive set of progressive music that fuses rock, chamber music, jazz, and good fun. On Petrophonics BOTM consists of Michael Bierylo on guitar, Ken Field on alto & soprano saxophones, flutes, and percussion, Erik Lindgren on piano, and Rick Scott on synthesizer and piano, plus numerous guests. My favorite tracks are the ones in which a frantic piano sets the pace with which the saxophone, guitar, and percussion struggle to keep up. Actually the band is tight as a knot kicking out quirky, complex constructions that pummel the listener with tunes are that as haunting as they are happy, and where dissonance and sweet melody battle for supremacy, both winning admirably. BOTM have established a sound of their own, yet I'm often reminded of bands like Aksak Maboul, Univers Zero, and Henry Cow. The music is quirky and theatrical. One of my favorite tracks is "One Hundred Cycles". How to describe this... how about avant-salsa, with a bit of avant-lounge jazz, trippy electronics, and some gorgeous guitar and sax playing. Tough stuff to describe. It's nice to hear a band playing true progressive rock. Music that is challenging, and sounds so freeform yet composed and goal-oriented, and while not necessarily breaking new ground, still manages to set itself apart from the rest. Each musician contributes equally and I find myself just as whether the sax, piano, or guitar is leading the fray. One of the better avant-progressive albums I've heard in 2000. You can visit Birdsongs Of The Mesozoic at their web site. Petrophonics is distributed by Cuneiform Records. You can visit their web site. Contact via snail mail c/o Cuneiform Records; PO Box 8427; Silver Spring, MD 20907-8427.